Jef Wong and Hudson Smales take us through the story behind the Air New Zealand Wordmark. The kiwi design and creative community have openly expressed and shared their thoughts on the recent rebrand of the iconic Air New Zealand. 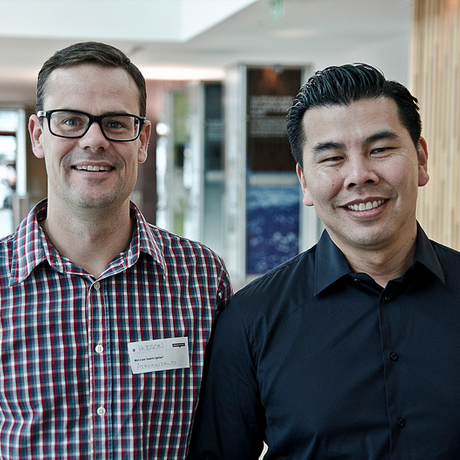 So, for the month of September, CreativeMornings /Auckland proudly presents Jef Wong Group Head of Design, Designworks and Hudson Smales who was Head of the Design House at Air New Zealand during the design process. They will both being taking you through the story behind the wordmark and the testing process behind the Air New Zealand Wordmark Development. Air New Zealand is a brand built on a strong investment in design and innovation. Informed by the brand strategy and visual identity program, already undertaken by Air New Zealand’s design and communication partners, it was agreed that a new wordmark was needed that was better aligned with the new brand promise, of ‘liberating travelers from the ordinary’. The wordmark needed to feel more modern and be imbued with a sense of momentum, credibility and elegance that would truly represent the character of the brand. Guided by a strict set of design principles, a highly collaborative process was undertaken between Designworks, Air New Zealand and renowned New Zealand typographer, Kris Sowersby. Jef Wong, Group Head of Design, Designworks Jef is the Head Of Design at Designworks, a role which sees him responsible for the design reputation and creative output for the Designworks group and profile. He is also involved at all stages of design from the development of initial creative concepts through to overseeing the design development, artwork and production of projects. Hudson Smales was Head of the Design House at Air New Zealand and now Director at Society Hudson is a specialist in user centered design helping companies develop culture, brands, products and services. Hudson’s approach draws on his 20 years of customer research experience translating identified motivations and behaviours into insights. He has honed this skill to enable these insights to be usable via creative tools such as visualisations and prototyping, developing user centered solutions that are commercially viable.